One narrative which we’ve heard from seasoned Energy Patch hands is that the market isn’t pricing in the possibility of possible disruptions, which, given the tensions in some production areas, could potentially cause further upward pressure. If you’re looking for exposure to the price of oil, there are some trusts out there which can accomplish that and pay you an attractive distribution yield. We just dipped our toe in the water with MV Oil Trust (NYSE:MVO), a pure play trust which gets over 98% of its income from oil. We’d like to hear from you about your favorites. The Trust was formed on August 3, 2006, under the Delaware Statutory Trust Act pursuant to a Trust Agreement among MV Partners, LLC, a Kansas limited liability company, as trustor, The Bank of New York Mellon Trust Company, N.A., as Trustee, and Wilmington Trust Company, as Delaware Trustee. The Trust was created to acquire and hold a term net profits interest for the benefit of the Trust unitholders pursuant to a conveyance from MV Partners to the Trust. The term net profits interest represents the right to receive 80% of the net proceeds from production from the underlying properties. The term net profits interest consists of MV Partners’ net interests in all of its oil and natural gas properties located in the Mid-Continent region in the states of Kansas and Colorado. The underlying properties include approximately 1,000 producing oil and gas wells. The net profits interest is passive in nature, and the Trustee has no management control over and no responsibility relating to the operation of the underlying properties. The net profits interest will terminate on the later to occur of (1) June 30, 2026, or (2) the time when 14.4 million barrels of oil equivalent (“MMBoe”) have been produced from the underlying properties and sold (which amount is the equivalent of 11.5 MMBoe with respect to the Trust’s net profits interest), and the Trust will soon thereafter wind up its affairs and terminate (Source: MVO site). MVO issues a 1099 at tax time. There is further information about OID at the end of this article. MVO pays a variable quarterly distribution, which fluctuates with the price of oil (BOE = one stock tank barrel of oil equivalent, computed on an approximate energy equivalent basis that one Bbl of crude oil equals six Mcf of natural gas and one Bbl of crude oil equals 1.54 Bbls of natural gas liquids). MVO pays in a January-April-July-October cycle. Distributions are generally paid by the 25th day of the month following the end of a calendar quarter. The Trust’s expenses tend to range in the $ 200-222K range, and averaged ~9% of cash proceeds available over the past four quarters. MVO should go ex-dividend soon, probably around 10/12/17, with a payout on 10/25/17. It’ll probably announce the Q3 ’17 distribution this week. You can track MVO’s current price and yield in our High Dividend Stocks By Sectors Tables (in the Basic Materials section). 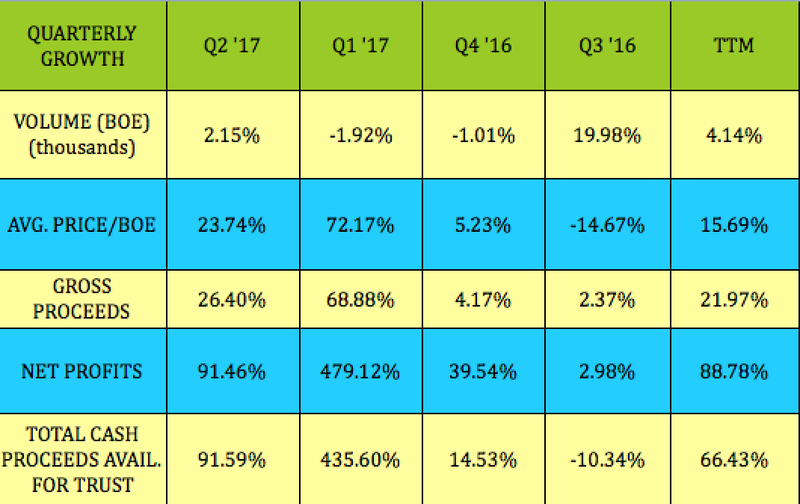 Since MVO’s quarterly distributions are tied to the price of oil, we put together a table which ties the distribution ranges to oil price ranges over the past eight quarters. The Trust paid out $ .20-.25 when oil was in a $ 44.50 to $ 47.50 range, but dropped all the way to $ .03 when oil was bottoming out in the mid-$ 20 range. 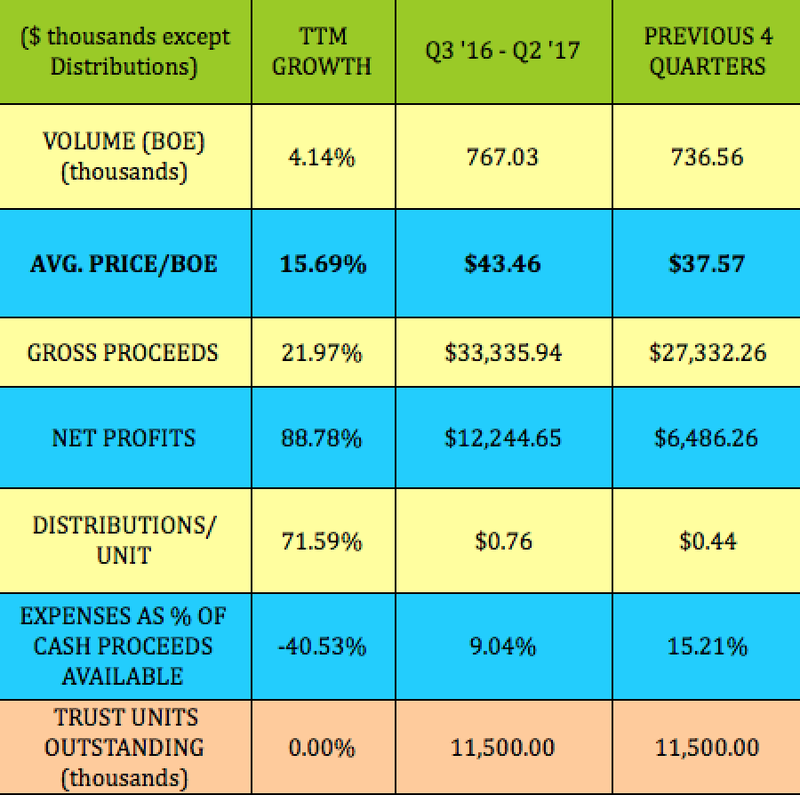 Overhead – There are some outlier quarters, such as Q4 ’16, when operating costs rose to $ 5.88M, and dropped net profits to $ 1.997M vs. $ 2.577M in Q3 ’16. Total volume has been pretty steady over the past seven quarters and averaged ~192K for the past four quarters. These TTM figures reinforce the importance of oil pricing to MVO – prices jumped by 15.69% over the past four quarters, which resulted in a 22% rise in gross proceeds, a whopping 89% jump in net profits, and ultimately caused a 72% rise in distributions/unit. 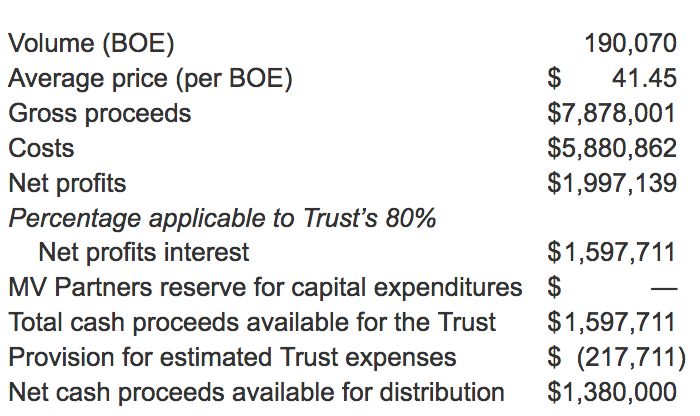 Trust expenses, which are relatively steady, subsequently shrank from 15% to 9% of cash proceeds available. The Trust maintains 11.5M units, of which MV Energy, LLC owns 25%, and VAP-I, LLC owns 12.5%. The two big gorillas in MVO’s cage are future oil prices and reserves. That means that the trust was entitled to the proceeds of 4.1M additional BOE as of 12/31/16. The trailing BOE production volume was 767K, which meant that MVO got paid on ~614K BOE. If this production rate is maintained, there should be over six years left of future payouts, before MVO has received its entire 11.5M BOE interest. This may happen as early as 9/1/2023. Of course, this is merely a projection, and the final date will be impacted by well depletions, volume from newer wells, and improved technology, among other things. The trust does spend funds on capex in order to maintain and improve its wells. We’ve listed the capex figures at the end of this article. 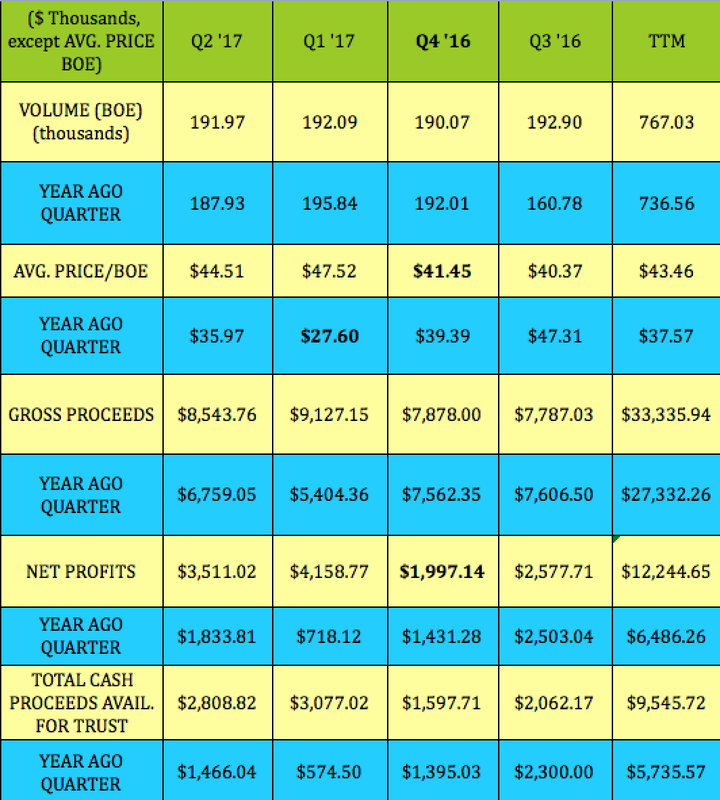 It also provided a net Present valuation of estimated future Net Cash Flows from the trust’s net profits interest – NPI. This five-year chart details how closely MVO’s price/unit is tied to the price of oil. When oil was up around $ 100 in 2013, MVO was $ 21.52. As oil bottomed out in early 2016, MVO went as low as $ 3.19, and has since recovered to ~$ 5.50, as oil is at $ 52.14. 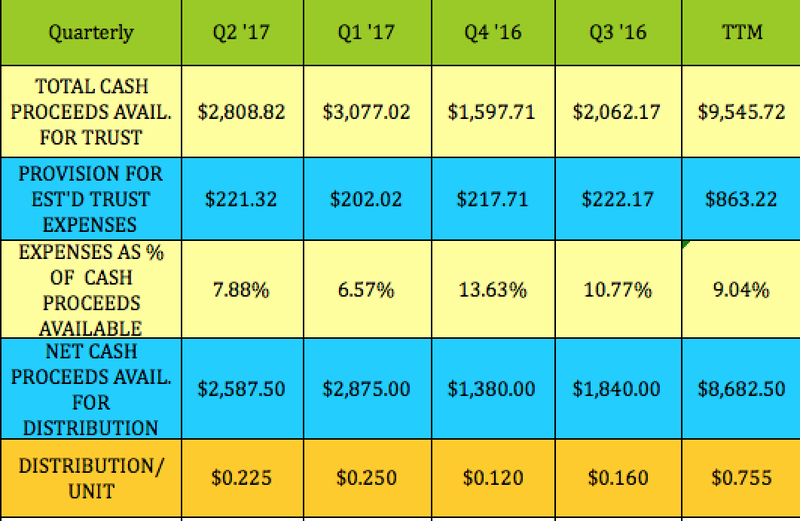 We wanted to get a sense of how MVO’s valuations compared to another similarly sized energy trust, so this table compares it to VOC Energy Trust (NYSE:VOC). VOC has a very similar market cap, but it does get a wee bit more income from natural gas, ~4.4% in 2016. MVO is getting a premium price/book valuation vs. VOC, but the market is demanding a higher dividend yield and a lower P/E. One of the reasons for that higher yield is probably the closer termination date for MVO – 2026 vs. 2030 for VOC. VOC has very similar, low trust expense levels – both trusts have operating margins of ~90% and no debt. MVO shows much higher ROA and ROE levels. MVO’s option yields aren’t currently that attractive, but you can see details for over 25 other income-producing trades in both our Covered Calls Table and our Cash Secured Puts Table. Definition: Original Issue Discount (OID) is a type of interest that is not payable as it accrues. OID is normally created when a debt, usually a bond, is issued at a discount. In effect, selling a bond at a discount converts stated principal into a return on investment, or interest. We rate MVO as a speculative buy, based upon the potential for attractive distributions over the next six quarters. Given the mid-$ 5 valuation, if MVO is able to pay out distributions of $ .22, you’re looking at a 16%-plus yield. Even a $ .15 quarterly distribution would approach an 11% yield. However, if you don’t want exposure to oil prices, MVO is definitely not for you. Disclaimer: This article was written for informational purposes only, and is not intended as personal investment advice. Articles posted on SA aren’t meant to be all-inclusive white papers, by any means. Please practice due diligence before investing in any investment vehicle mentioned in this article. Disclosure: I am/we are long MVO. Editor’s Note: This article covers one or more stocks trading at less than $ 1 per share and/or with less than a $ 100 million market cap. Please be aware of the risks associated with these stocks.